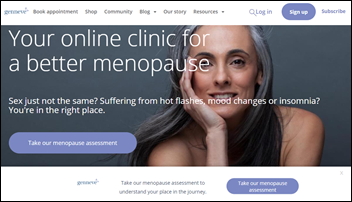 Men’s health company Ro, known thus far for erectile dysfunction, hair loss, and smoking cessation services and products, launches virtual visits and prescription delivery services for women going through menopause. The new Rory vertical is guided by an all-female advisory board, including former US Surgeon General Jocelyn Elders, MD. Ro’s foray into the menopause market isn’t as groundbreaking as some headlines would suggest: Seattle-based Geneve, which features an all-female team, launched a similar service late last year. It’s interesting to note that the women in the first two screenshots are most likely models. Neither look as if they’ve suffered a hot flash or any other menopause-related discomfort – ever. Nurx, a fast-growing telemedicine company largely known for its birth-control services, decided to eschew the too-beautiful-to-believe aesthetic in favor of using real customers in its non-Photoshopped advertising campaigns. “For us, we wanted to capture the emotions in our customers but do that in a real way versus trying to say that we are doing something and not really doing it,” explains Nurx VP of Marketing Katelyn Watson. Medical billing and practice management company Zotec Partners plans to build a five-story headquarters near its current location in Indianapolis. Zotec also has offices in California, Florida, Georgia, Nevada, New York, Pennsylvania, and Texas. Practice management company US Urology Partners names Jay Rom (Professional Radiology) VP of ASC operations. The American Osteopathic Association names Kevin Klauer, DO (TeamHealth) CEO. Aledade moves co-founder and CTO Edwin Miller to chief product officer, and promotes Brady Richards to CTO and Emily Maxson, MD to CMO. Aprima adds RavePoint’s automated patient engagement and messaging, and appointment scheduling and management technology to its EHR and practice management software. Nordic will exhibit at Texas HIMSS March 25-26 in Austin. A paywalled survey of 766 telehealth users and non-users finds that the majority of users relied on virtual video visits for access to care, and were less connected to PCPs than their non-user counterparts. Survey analysts caution that telehealth may further fragment care if telemedicine providers and traditional practices can’t figure out how to share information and coordinate care. Coding and billing company LogixHealth names Jim Blakeman (Institute for Emergency Medicine) EVP. Global Partnership for Telehealth hires Matt Strickland (Memorial Satilla Health) as CTO. Allscripts integrates Opargo’s physician scheduling optimization software with its practice management technology. A survey of 6,000 Heal app users finds that the app-based house call service helped first-time patients access timely care, and avoid trips to the ER and urgent care – a figure the company equates to $65 million in healthcare cost savings. Former firefighter Dave Graybill creates Hlthe, a Go Fund Me-like app designed to help people raise money for healthcare needs. The app’s differentiating factor is that it ensures donations are only spent on healthcare, and allows donors to track their funds. Graybill also markets the app to employers who want to give Hlthe credits as rewards within their wellness programs. He hopes to eventually offer Hlthe gift cards. 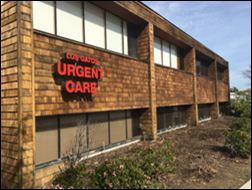 The married owner and manager of the Los Gatos Urgent Care Clinic in California face eight felony counts relating to filing false insurance claims after an audits finds a 100-percent error rate for billing, and billing for services never rendered. In one case, a patient was billed $700 for a typically $10 pair of foam slippers. Billing and RCM vendor ImagineSoftware acquires healthcare payment automation and analytics vendor ProviderAlly. One practice is large, with a very corporate feel. It offers lots of amenities, but I wonder if I’ll get lost in the shuffle when it comes to personalized care. The other practice is small. It’s a family-owned and operated business with fewer amenities, though its quality of care seems equal to its larger competitor. Continuity of care might be an issue at both. While both practices have just one orthodontist, the smaller one’s provider will likely retire within the next year or two, leaving me wondering who will step into his role. Given that quality of care seems equal, price will likely be the ultimate deciding factor. The smaller practice has offered me a significant Facebook discount. Given that the larger practice is much closer to my home, I might just try seeing if they’ll match the discounted price. That’s something I’d never think to do with traditional medical care. This experience has made me reflect on the difference in patient engagement techniques between traditional healthcare providers (at least those I’ve encountered) and orthodontics. I can’t recall ever having received as many follow-ups from the various primary care docs, dermatologists, and OB/GYNs I’ve seen over the years. I have never received a reminder that it’s time for any type of annual exam. That lack of communication makes me wonder just how focused my area practices (the majority of which are owned by large health systems) are on value-based, preventative care. It’s no wonder so many of us are eschewing traditional practices for more convenient though less personal options like retail clinics, urgent care, and telemedicine. SimplifyASC raises nearly $3 million as part of a Series A round led by Jumpstart Capital. The ambulatory surgery center-focused EHR and practice management company was spun out of the assets of CSS Health Technologies and Ormed Information Systems, which merged in 2014. 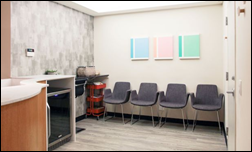 After a year-long pilot, Convene will add primary care clinics developed and managed by Eden Health across its network of co-working spaces, initially starting with Boston, Chicago, Los Angeles, New York, Philadelphia, and Washington, DC. New York City-based Eden Health, which also offers insurance navigation services, announced a $10 million Series A round several weeks ago. Iora Health will expand its primary care services for Medicare members to Texas this fall. The company, which operates similar practices in six other states, will hire up to 60 employees to staff its Houston practices. University Physicians’ Association adds patient billing messaging and billing interface software from Relatient to its medical billing services for physician practices. The University of Illinois at Chicago’s Division of Specialized Care for Children selects care and community services coordination software from Eccovia Solutions. Canadian health IT company Reliq Health Technologies names Rob Prouse (Bentley Systems) CTO and Bassma Ghali chief innovation officer. AHRQ develops the Question Builder app to help patients better prepare for medical visits. Users have the ability to select questions to ask their provider from a list compiled by AHRQ based on type of medical encounter, take notes and pictures during their visit, and share their documentation with others. 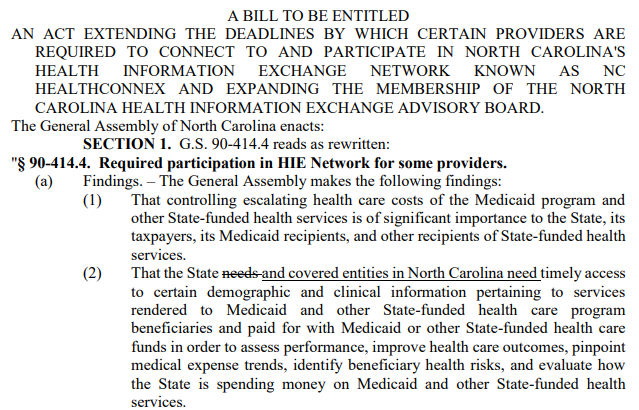 Behavioral health providers in North Carolina are pushing for more time to connect to the statewide HIE ahead of the mandated June 1 deadline. Lawmakers have introduced a bill that would give them two more years to get their EHRs up, running, and connected; but it has faced opposition from those who feel interoperability should happen sooner rather than later. 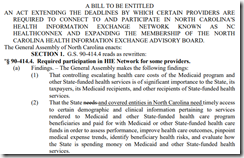 Affected providers have cited prohibitively expensive EHR costs and lack of suitable systems as the reason for their delay. Primary PartnerCare ACO Independent Practice Association (NY) finds that patients who consented to have real-time care alerts sent to their PCPs via the Healthix HIE experienced significantly lower rates of hospital admissions and 30-day readmissions. 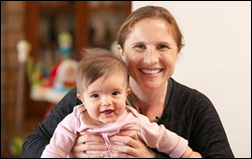 First Pi Day, then Match Day: UC San Diego Health profiles Olympic soccer gold medalist and UC San Diego School of Medicine student Rachel Van Hollebeke and her anticipation of Match Day on Friday, March 15. Van Hollebeke, who wants to go into family medicine, will follow in the footsteps of her great grandfather and grandfather – both GPs; and father, who recently retired after a 40-year career as a cardiothoracic surgeon. Addiction recovery tech company MAP Health Management raises $25 million in a Series A round led by Aetna. Map, which offers virtual visit software and outcomes reporting to aid recovery after treatment, will use the money to expand its customer base beyond addiction recovery providers to primary and emergency care, and pharmacies. Nextech Systems adds Relatient’s patient engagement technology to its EHR and practice management software for specialty practices. Behavioral healthcare and community services provider Community Alliance (NE) selects the SmartCare integrated health IT platform from Streamline Healthcare Solutions. 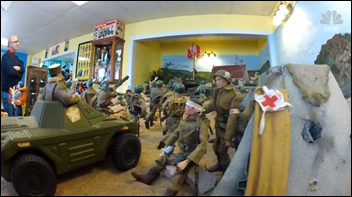 DrChrono adds educational 3-D interactive modeling and animation videos from 3D4Medical to its EHR. Eye care health IT company Rev360 promotes Scott Filion to CEO, and Jamie Hughes to SVP of subsidiary Professional Eye Care Associates of America. “Picture a place where GPs are adored.” Providers at Temora Shire Council release the adorable, La La Land-inspired “Great Quack Quest” video in an effort to recruit new physicians to the small town in Australia. (The outtakes are just as fun.) Three of Temora’s eight physicians will retire within the next five years. Aprima will exhibit at the LHC Group Revenue Cycle Leadership Conference March 11-12 in New Orleans. EClinicalWorks will exhibit at the AAPM Annual Meeting March 7-9 in Denver. It’s time to face the truth—we’re not living in the same world we once did. According to the Pew Research Center, 95 percent of American adults own a cell phone and 89 percent use the Internet. This is a huge increase since the year 2000, when nearly half of the population reported not using the Internet at all. With such incredible growth in access to (and comfort with) technology, it’s easy to see why patients say the use of digital tools is a priority to them in a healthcare organization. In fact, one study found that the use of technology increases patient satisfaction scores by 10 percent or more. And while a majority of healthcare facilities understand the need, many have not yet adopted streamlined digital communications or payment options that meet current patient needs. In fact, only about 9 percent of providers offer all of the digital tools patients want. Are you still sending the good old paper bill? If so, you are not alone — 86 percent of patients report receiving paper medical bills. This is true regardless of the fact that 85 percent say they would prefer to pay online! But is it really such a big deal? The answer to that is a resounding YES! Experts report that 65 percent of patients say they would switch healthcare providers for a better payment experience. Fortunately, using digital methods to send and process payments has never been easier. Not only can you process payments through typical methods like a patient portal, but with today’s technology, balance notifications can be sent directly to a patient’s phone via text message or email. These messages can include a direct link to a secure payment screen where patients can process their payments within minutes. It’s easy and fast—but more importantly, it’s what patients want. For years and years, the only way to make an appointment with a healthcare provider was to call the office. That is all changing. We now live in a time where we’re accustomed to doing everything from buying movie tickets to scheduling a haircut via a simple click on our smartphone. The use of online scheduling — where patients book their own appointments whenever or wherever they may be — is becoming a must-have for healthcare organizations. It takes less than one minute, on average, to schedule an appointment online. In contrast, appointments scheduled by phone take an average of eight minutes. That’s just not practical for patients OR their healthcare organizations. Seventy-seven percent of patients prefer to schedule appointments online. And practices can make that experience even easier with the right technology. When online scheduling is integrated with your practice management system, it can identify existing versus new patients and adapt the forms so existing patients don’t have to provide information that you already have. Of course, you want to make sure you stay HIPAA-compliant whenever you may be sending PHI via text message. Make sure to use technology that offers the tools to stay compliant. It’s something every healthcare organization has experienced: A patient posts a negative review about your services. Most of the time, these negative experiences can come as a complete surprise. Fortunately, there is a simple way to drastically improve your chances of handling issues before patients lash out online. The simple solution is the use of patient surveys. Patient satisfaction (and provider success!) is closely tied to how patients feel about what happened during an appointment. Sending a survey to patients after a visit is a great way to better understand problems and be able to address issues. In the past, most organizations asked patients to fill out paper surveys in the office. This method is now very outdated. Paper survey results are very ineffective at making any real change. Using technology to email or text your patients a survey after their appointment increases the likelihood that they will give more honest responses. It also makes it a whole lot more likely that they will be filled out. When it comes to making patient satisfaction a priority, it’s critical to gauge if your current technology is up to the challenge. Technology can greatly improve how your patients view you and your entire practice. It can also improve the productivity and efficiency of you and your staff. Digital technology has changed the world as we know it. From business to education to health, no corner of the world has been left untouched. It allows for better communication between a healthcare organization and their patients, smoother methods for scheduling and payment, as well as an improved patient experience. Now is the time for you to take advantage of the benefits offered by the digital revolution.